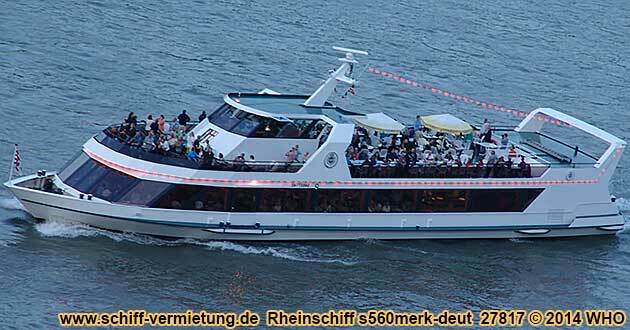 Round cruise boat tickets enormous firework "The Moselle river in fire magic"
Approved up to 300 people. Up to 208 seats below deck. More pictures of the boat. Inside pictures of the boat. round cruise boat ticket(s) for adults and children from 15 years offer no. WIF0902merk together with cold / warm buffet per person 46 EUR. There is a 19% added value tax included in the boat ticket price. Price change because of tax increase, diesel price increase, increase of the firework fee etc. possible until 4 months prior to the boat cruise date. If there is a price increase you have the right to cancel the boat tickets free of charge. Sunday, September 8, 2019, Winningen on the Moselle / Mosel river, about 12 km from Koblenz / Coblence on the Rhine river. Boat trip with dance to the enormous firework "The Moselle river in fire magic" with round trip. The biggest firework on the Moselle / Mosel river. Arrival in Coblence / Koblenz. Coming from the south from the freeway exit Coblence / Koblenz-Nord (north) (A 48) resp. from the federal highway B 9 from the north, drive in Coblence / Koblenz over the four-lane Neue Moselbrucke (new Moselle / Mosel bridge) (Europabrücke) (Europe bridge). Range yourself into the 2nd land from the right, drive into the distribution circle and turn off in direction center and theater. Drive about 900 meters straight ahead and turn right at the Hotel Trierer Hof / Theater. After about 250 meters, following the decal information Altstadt (old town), turn left. After driving about 200 meters in the opposite direction, turn right into the Stresemannstrasse. Drive about 200 meters until the Konrad-Adenauer-Ufer (shore). At the Konrad-Adenauer-Ufer there are parking possibilities. Besides this, you'll reach the parking lots on the Deinhardplatz (place) and in front of the castle from the Stresemannstrasse. The boat landing stage 8 is at the Pegelhaus (water level house) between the Stresemannstrasse and Rheinstrasse. Coming from the south over the federal highway B 9 turn right behind the gas station into the Mainzer Strasse after you've driven underneath the Sudbrucke (south bridge). At the first traffic light turn right further into the Mainzer Strasse and keep the main direction. After about 2.8 km turn right after the castle into the Stresemannstrasse. From there it's about 200 meters until the Konrad-Adenauer-Ufer. You'll reach parking lots on the Deinhardplatz (place) and in front of the castle from the Stresemannstrasse. Departure in Koblenz / Coblence on the Rhine river (left Rhine river side) 6:30 p.m. Boat trip on the Rhine and Mosel / Moselle rivers, about 12 km from Koblenz / Coblence, along fortress Ehrenbreitstein, Deutsches Eck (German Corner), Coblence / Koblenz-Neuendorf, Koblenz / Coblence old town with collegiate church St. Kastor and castle Alte Burg (old castle), old Moselle / Mosel river bridge (bridge Balduinbrucke), Coblence / Koblenz-Lutzel, bridge Eisenbahnbrucke, new Moselle / Mosel bridge (bridge Europabrucke), Mosel / Moselle river watergate, Coblence / Koblenz-Metternich, Coblence / Koblenz-Rauental, bridge Kurt-Schumacher-Brucke, Coblence / Koblenz-Moselweiss, bridge Eisenbahnbrucke Guls, Coblence / Koblenz-Guls, Coblence / Koblenz-Lay, Winningen, camping ground with yacht harbor Winningen, under the freeway A61 through towards direction Dieblich. Shortly before Dieblich, the boat turns and drives back to Winningen on the Mosel / Moselle river to the big firework. Seating place below deck on a passenger boat, live music and dance on board. The firework can be seen from the open air deck or upper deck. Return in Coblence / Koblenz about 11:15 p.m. No disembarkation possible in Winningen. boat tickets for children from 10 to 14 years with own seating place offer no. WIF0902merk together with cold / warm buffet per child 43 EUR. boat tickets for children until 9 years with own seating place offer no. WIF0902merk together with cold / warm buffet per child 40 EUR.